NEW ORLEANS—Conference madness gave way to national poll sanity. For the second time this fall, the Division I men’s poll saw the top ten teams remain exactly the same as the week before. The NCAA National Coaches’ Poll was released on Tuesday by the U.S. Track & Field and Cross Country Coaches Association (USTFCCCA). The women’s National Coaches’ Polls were also released Tuesday. Eight of the top ten teams in the poll (No. 1 Colorado, No. 3 Syracuse, No. 4 Oklahoma State, No. 5 Iona, No. 6 Wisconsin, No. 7 Villanova, No. 8 Portland, and No. 10 Northern Arizona) held onto their ranking on the strength of winning a conference championship. Only Portland piloted itself through any drama, with a narrow three-point win over No. 15 BYU in the West Coast Conference. 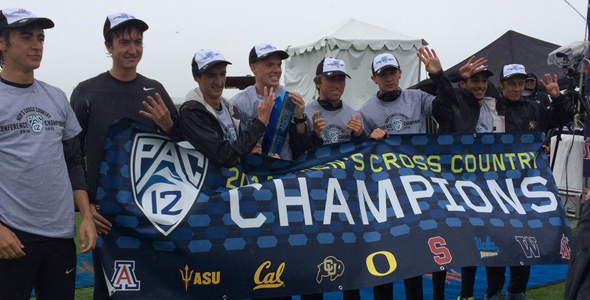 The two top-ten teams that didn’t win league titles are in there out of respect for the Pac-12: runner-up No. 2 Oregon and third-place No. 9 Stanford were separated by just three points on Friday. While the status quo was rock-solid in the upper third of the poll, No. 3 Syracuse did nearly vault over Oregon. The Orange received just one less point, 336 to 337, than the Ducks. Beyond Cuse, the ACC was responsible for many of the biggest moves in the rest of the rankings; the two biggest jumps in the country came from the Research Triangle. Previously unranked No. 18 NC State rejoined the poll after a strong runner-up finish at Panorama Farms on Friday. After a mediocre Notre Dame performance, the Wolfpack dropped from No. 16 to 28, and after a poor Pre-Nats showing, they dropped out of the poll entirely. Now the Pack are roughly back where they started. No. 22 North Carolina was just five points behind NC State at ACCs; the Tar Heels climbed six spots in the poll. Both teams beat No. 28 Virginia, whose 15-slot tumble was the biggest move of the week. All three teams will face off at the Southeast Regional championship next Friday against No. 16 Furman. For the fourth time this season, the Paladins hit an all-time high in the rankings; they did so this week after having the first nine finishers at the Southern Conference meet. No. 29 Air Force returned to the poll and knocked out Colorado State after beating them by three points in the Mountain West. Like CSU, Princeton missed making the poll by just two points. The Tigers won the Ivy League on Saturday. The USTFCCCA polling archives go back to 1995. In those 20 seasons, No. 11 Washington had never been ranked as highly as they are now. The Huskies’ best national finish in that period is their 12th place from 2006; before that, their best was eighth in 1993. Penn State returned to the poll at No. 24 after beating then-Nos. 20 and 22 Indiana and Michigan State to tie PSU’s highest ever finish at the Big Ten meet. (Though they did win the Atlantic 10 in 1990). With the Nittany Lions joining the poll, the Big 10 is tied with the Pac-12 for most ranked teams at five. Of course, three B1G teams are in the 20s, while four PAC teams are in the top 11. This is the penultimate national poll of 2014. Regionals are on Friday, November 14, and the final national poll will be released on Monday, November 17. The NCAA Championships will be held Saturday, November 22, in Terre Haute, Indiana, at the LaVern Gibson Championship Course.